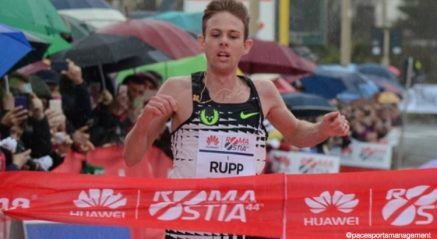 11th March 2018 – Chicago Marathon champion Galen Rupp (USA) ran the second fastest time ever by an American athlete as he dominated the 44th edition of the Roma Ostia Half Marathon. With splits of 13:50 (5km), 28:09 (10km), and 42:44 (15km) on route Galen executed his race plan exactly as he wished and came home in 59:47, 57 seconds ahead of the runner-up. After the race Galen said he was “happy with how the race went and he knew he was in good shape”. It puts him in a great place now to finalise his preparations for the Boston Marathon where he will be looking to improve on his second-place finish from last year. Jordan Hasay (USA) will also be racing in Boston and she too showed she is moving well taking second place in the US 15k Championships. Jordan clocked 48:40 which is 48 seconds faster than she ran in the same race last year prior to her finishing 3rd in Boston on her marathon debut.